Costume Burgundian noble woman in the 15th century. Home » Costume Burgundian noble woman in the 15th century. Burgundian noble woman in 145, late Medieval period. 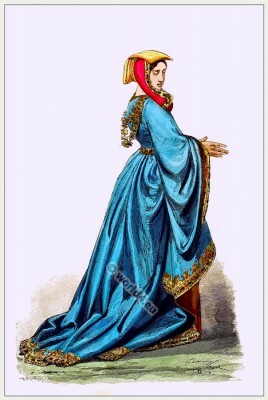 Main feature is a long, belted overcoat with a train, as the so-called Kruseler headgear, a kind of hennin with plenty of ruffles at the edges enclosed hood. Late Gothic period. This entry was posted in 1450, 15th Century, Burgundian dress, Court dress, Hairstyle, Headdresses, Middle Ages, Nobility and tagged Burgundian fashion period, Cotehardie, Cotte, Gothic costumes, Hennin on 5/31/13 by world4.